Windows: You can export a slide show as a movie file (.wmv) or a PDF file. Macintosh: You can export a slide show only to PDF. If you’re a Macintosh user, you can use Adobe Premiere Elements if you want to export a slide show as a video file. You can always download the trial version of Premiere Elements and test it for 30 days to see whether this application works well with Elements for the kinds of creations you routinely make. Slide show PDF: The slide show is a single PDF file with multiple pages — one page for each photo. This option is like having a photo book where you turn the pages manually. If you export to PDF with transitions, the transitions don’t show up when you’re viewing the file with a PDF reader on your iPhone, iPod touch, or iPad. Slide show movie: To show off your slide show complete with auto page scrolling and transitions as they were applied when you created the slide show in Elements, you need to save the slide show as a movie file, with help from Adobe Premiere Elements. Premiere Elements is a companion product for Photoshop Elements, and you can purchase both applications together at a discounted price. When you create a slide show in Elements, you can add audio to the project. If you create a slide show without audio, you also have an option in Premiere Elements to add audio to the project before exporting to a video format. You assemble a project in Premiere Elements by getting media files in a similar fashion as you do in Photoshop Elements. What’s important to know when exporting files for viewing on iPhone or iPad is that you need to be certain to export in the format appropriate for the device. 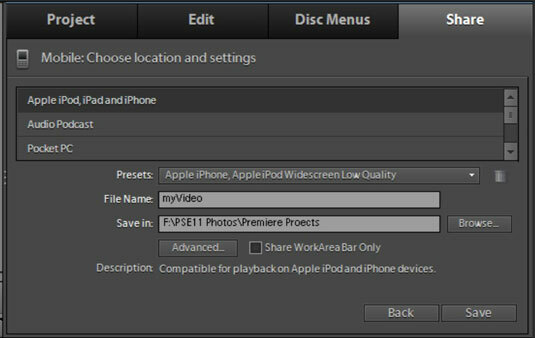 In Premiere Elements, you have support for the iPhone/iPod (iPad can use the iPhone export option or one of six other options from the Widescreen and Standard categories). For Mac users, Premiere Elements offers you support for importing individual photos that you can combine similar to the way that Windows users create slide shows in Elements. If you’re an Android user, you can export movie formats, such as .wmv, which you can view on Android systems. Click the Mobile Phones and Players option when you’re ready to export the project to a video file. Apply all the settings for your media file. Click the Save button, and the file is saved in a format that displays well on your device. If you want to export a project from Premiere Elements for use on the iPad, you must use the same option as you do for the iPhone or one of the iPad presets. Using a format other than the Mobile Phones and Players option produces a poor-quality video. After exporting the file upload the file to a folder in the GoodReader directory. After the upload completes, your file appears and plays exceptionally well, complete with transitions and audio, on your iPhone or iPad.